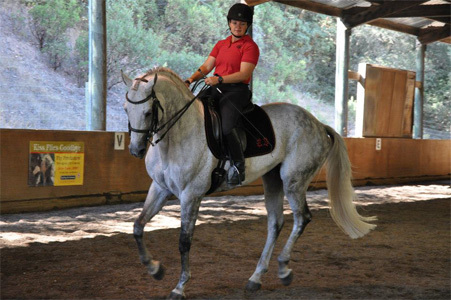 Four Star Farm offers English horseback riding lessons, training and camps in Winters, California, helping riders achieve a happy partnership and succeed in competition. We welcome all ages and levels, provide a dedicated showing and competition curriculum—dressage, jumping, eventing—and a positive atmosphere that promotes friendship and enjoyment for both riders and horses. Virginian Sky is a German-bred and U.S.-stationed Trakehner stallion approved by the American Trakehner Association and the German Arabian Sporthorse Association (ZSAA). We invite you to learn more about our wonderful stallion, who is currently competing at Fourth level with scores in the 70s. He has a breathtaking passage and piaffe. 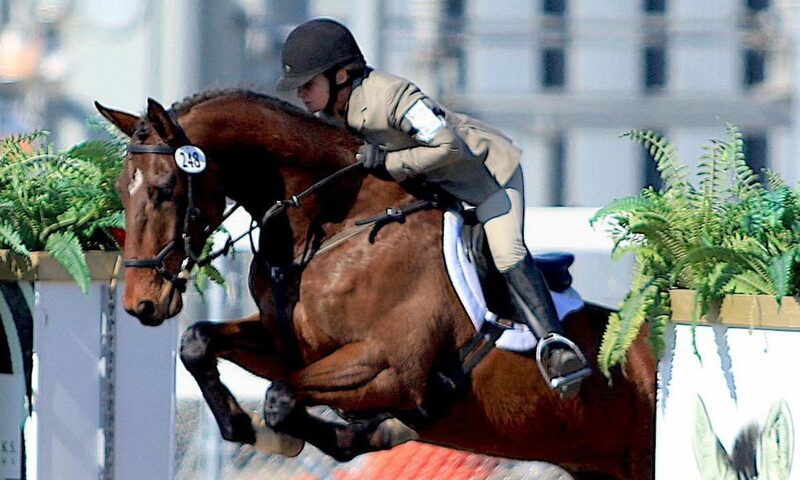 He has also successfully competed up through Preliminary eventing. His foals from 2012 are all beautiful, refined fillies that will be gray! 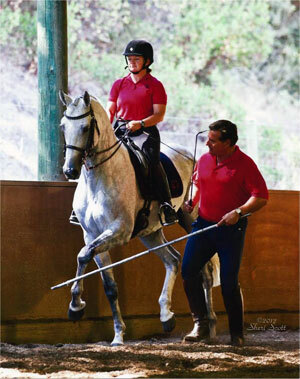 Classically trained at the Portuguese Riding School, Alfredo Hernandez specializes in piaffe and passage. He utilizes these classical movements to develop strength and improve each horse’s gaits. Originally from Jerez, Spain, Alfredo has become one of this country’s leading experts in developing and schooling the piaffe and passage in-hand. In the piaffe/passage, he is currently coaching Steffan Peters, Alyssa Pitts, Heather Blitz, Betsy Steiner, Sandy Howard, and has coached many other top riders from around the country including Hilda Gurney, Jan Ebeling, and Leslie Morse. He works with horses in all stages of training, from three-year-olds through FEI, developing the basics for piaffe and passage and improving piaffe and passage for seasoned competitors. Riders and horses of all levels are welcome. He works his magic with all ages and breeds. Horses in the clinic need not be started in passage and piaffe. Lessons can be designed to introduce or develop passage and piaffe and can also provide focused instruction in other areas of dressage. Alfredo enjoys working with amateurs and professionals alike. His clinics are fun (featuring his infectious sense of humor) and educational for everybody. Schedule a dressage, show jumping or cross-country clinic in your area. Clinics can be tailored to your group’s interests. Dressage lessons are usually 45-minute, private sessions, while show jumping sessions group three riders of similar levels together. Scheduling Natalie for a day-long clinic: $1,200 plus expenses. Inquire about the possibilities to enrich the partnership with your horse and take your riding to a higher level! E-mail Natalie for available dates. Visit our calendar for the competition schedule. Treat yourself to equestrian travel in 2018! Immerse yourself in the world of Trakehners by joining Four Star Farm owner and trainer Natalie Brady on a trip to the Trakehner gala and stallion approvals in Germany. This annual October event provides the premier opportunity to learn about every aspect of the breed and all it has to offer or simply see gorgeous horses.